Have a great day out and visit BWA at the same time. Brilliant Wall Art are displaying their excellent wall art and other home furnishings and products at many events and festivals this year. In June 2017, we are proud to attend the RAF Cosford Airshow, the Himley Hall Steam & Country Fair and the Lincolnshire Show. "To provide an extensive range of contemporary and quality decorative metal wall art and home accessories at the lowest possible prices". Now in its fourth year, this event is established in the Himley Hall and Park events calendar. The event is open to all types of vintage transport and has a popular Country Fair, including over 100 craft and country stalls. Stroll through Himley Park and enjoy the sights and sounds of the collection of over 100 exhibitors including full size and miniature traction engines and vintage vehicles including bicycles & motorcycles, classic cars, tractors and more! Don’t be shy, chat to the owners; there is nothing they like more than to tell the history of their exhibit. Free event, a car parking charge applies. RAF Cosford are proud to welcome Brilliant Wall Art to their prestigious air show. They say… "Midlands premier wall art and home accessory specialists attend the Midlands premier air event this year!" (RAF Cosford). This is not just a local, ‘what’s On in Shropshire’ activity, it is one of the UK’s premier air events which takes place in the Midlands. This celebration of aircraft offers non-stop entertainment both in the air with displays from a variety of aircraft and on the ground with hundreds of exhibits, stalls, trade stands, military demonstrations and children's entertainment. For 2017 one of the key themes is 'Battlefield Support' which will showcase aircraft that play an important role in times of conflict. Admission charges apply. Tickets must be purchased in advance, visitors cannot purchase on the day. Please note that free admission to the Museum is not available on the day of the Airshow. Tickets are on sale now via the Website at a cost of £25.00, with a transaction fee. Children under 16 are free, when accompanied by an adult. Purchase Tickets Now before it's too late!!! 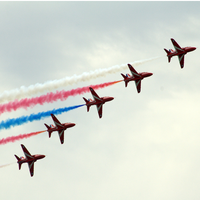 The flying display starts at 11.30 am and will finish at approximately 17:30 with the Showground closing at 19:00. Experience a true celebration of rural Lincolnshire with an eclectic mix of breathtaking entertainment, food, shopping, music, horticulture and farm life. The Lincolnshire Show is a true celebration of rural Lincolnshire, with an eclectic mix of breathtaking entertainment, food, shopping, music, horticulture and farm life - creating the perfect family day. Brilliant Wall Art’s Simon Janssen say…‘you must visit our superb display stall at the 133rd Lincolnshire Show, on 21st and 22nd June 2017. There is something for everyone to enjoy at this premier event’. At one of the top county shows in the country, you’ll be spoilt for choice with a huge selection of entertainment to see, exhibitors to meet and places to enjoy a bite to eat. In the Main Ring, watch elegant showjumping, hear performances from concert bands and marvel at breath-taking displays from Broke FMX. Enjoy the action in style with a glass of Pimms on the Member’s Lawn, or from the comfort of the hospitality marquee. Explore the Food Court to pick up your favourite local treats, and sit down to learn from top local chefs in The Lincolnshire Kitchen. Head to the Horticultural Zone to see beautiful blooms, or to the Aviation Zone for a slice of Lincolnshire’s sky-high history. Visit the Agricultural Lines to see machinery from past and present, and there’s plenty for our younger visitors to see, make and do in the Discovery Zone. Help to judge the Lincs FM Showstoppers competition in the Sports Zone, and round off your day with a shopping spree. Whatever you plan to do, we hope you have a wonderful time at the 2017 Lincolnshire Show! Party passes can be booked in advance for a minimum of 15 people and the cost for pre-booked adult is £17, young person £12 and children £6. Please note that a booking fee of 90p per ticket applies when buying online. We're exhibiting some of our best selling metal wall art, resin wall art, wooden signs and more, so hurry whilst stocks last. Many of our pieces of wall art are on sale at these events with large discounts on selected items. I particularly like the Metal Wall Art Aeroplane outline, with an intricate wire frame design, constructed from formed metal rods. It is a deal for any aviator or plane enthusiast, measuring approximately 71cm (28") wide by 33cm (13") high. Brilliant Wall Art provides the best value metal, glass and canvas wall art across the UK, with numerous contemporary metal wall art designs for both the home and office. Brilliant Service - Order now, collect at the event. Bring out the Artist in You...Your walls are Your Blank Canvas!! !